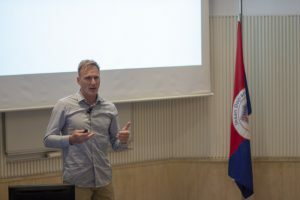 From his perspective as co-owner and creative director of IJsfontein, a Dutch firm that specializes in “playful learning experiences,” Mr. Wagenaar discussed the use of games in today’s world for learning and educational purposes – a usage he referred to as “serious games,” as opposed to the more mainstream use of games for entertainment. Such games are designed for different age groups, from school-aged children to the elderly, and are used in sectors ranging from education and health care to the arts. Mr. Wagenaar noted that these game projects offer a playful learning experience by providing the learners a safe place to make mistakes and try again to arrive at a solution. He offered examples of the types of games his company has produced in order to serve people with different learning needs, enabling them to learn how to take care of a mental patient by playing a video game or discover Van Gogh’s painting techniques by using an app. In Mr. Wagenaar’s view, interactive games stimulate learners’ curiosity and make them feel special by encouraging them to find their own solutions. “When an interactive project is experienced, users will learn by doing, gain new perspectives, and face autonomous challenges and endless complexity,” he stated.